Check out our amazing Bone inlay furniture stencils! These stencil kits are expertly designed to help you to create the look of popular inlay furniture for much less! Real camel bone inlay dressers and tables are meticulously handcrafted and can be very expensive, and with our inlay stencils you can turn any plain piece into a DIY inlay treasure! Imagine stenciling a garage sale find into a gorgeous, trendy and stylish inlay masterpiece! Our Neera Bone Inlay Furniture Stencil Kit includes 3 inlay stencils and has an unmistakable tribal flare. These stencil designs are intricate and beautiful, but at the same time, very durable, reusable and easy to work with. You can stencil these inlay designs using a mini-roller or a stencil brush. We recommend using craft acrylics and not wall latex paint, as it is too gummy for these fine stencils. To avoid bleed, please use stencil spray adhesive. 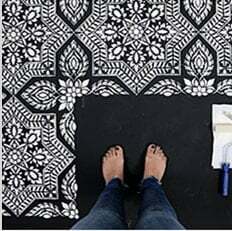 Want to learn the easiest stenciling technique? Here are the detailed illustrated Roller Stenciling Tips. Watch our easy to follow short step-by-step Video Tutorials! You'll find them extremely helpful for your stenciling project. Since it's a reusable sturdy stencil, and not a vinyl decal, you can reuse it many, many times and create your own cool paint color combos! You'll also get the satisfaction of knowing that you've created your own hand-painted masterpiece. Stencils are not difficult to use and don't require artistic ability. Even beginners get fabulous results! Just follow our illustrated instructions (included with every purchase). We find that it is not necessary to use spray adhesive with our stencils. However, if you want very crisp edges or are using high contrasting colors, you may want to consider using it (Elmer's spray adhesive seems to be the best). I personally prefer just to attach pieces of blue painter's tape to secure the stencil, but for beginners it may be helpful to mist a stencil with spray adhesive just to make sure you get great results. All of our stencils are made of thick, sturdy plastic, and are reusable, easy to clean and stenciler-friendly! In our 20+ years of professional stenciling this material has proven to be far superior than any other material we used, including the industry standard 8 mil mylar. We are certain you'll notice the difference and will love working with it, just like all the folks who already bought our stencils. Our stencils are made to last and with proper care and storage will serve you for long time.